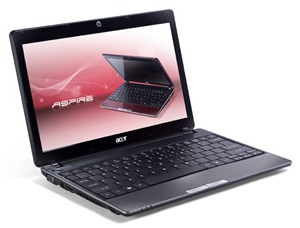 Acer is one of the best known names, responsible for sparking the netbook craze with the launch of their immensely popular Acer Aspire One. They are now refreshing that line with two new Acer Aspire One AMD-powered netbooks, the 11.6” Acer Aspire One AO721 and the 10.1” Acer Aspire One AO521. Both machines are powered by the new AMD Athon II NEO K125 processors, discrete AMD ATI Radeon HD 4225 graphics and 250GB HDDs – a combination that provides a nice balance between performance and battery life. The bigger AO721 comes with 2GB of RAM and Windows 7 Home Premium, while the slightly smaller AO521 has a 1GB of RAM and Windows 7 Starter. Other perks include an HDMI port, 802.11n wireless, a webcam, and a multi-touch trackpad. Pricing starts at $429.99 for the AO721 and $349.99 for the AO521. Great news for AMD fans!